Bowen Designs’ statue output has been pretty impressive in recent times. 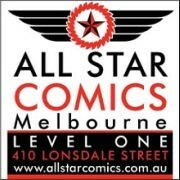 Randy Bowen and his team are steadily working through the corners of the Marvel Universe which have yet to be covered by Bowen’s Marvel licence. Amongst the great range of characters being produced, founding Avenger Hank Pym has been getting some special attention. I’ve already reviewedBowen’s Ant-Man Full Sized Statue, and now it’s time to look at the Bowen Yellowjacket Full Sized Statue. When I first “met” Hank Pym in the comics, he was in his Yellowjacket identity and costume and was rejoining the team in Avengers Vol 1 #211 for a short tenure that would end badly. Yellowjacket has become synonymous with the troubled aspects of Hank’s life and personality. 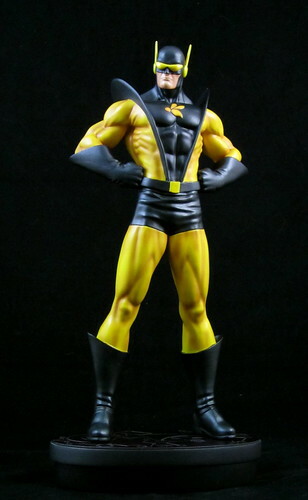 The Yellowjacket costume is also, in my humble opinion, one of the better superhero costumes around. One of the best Yellowjacket stories in my mind, apart from the Egghead epic back in that early run, is Avengers Forever, where a group of Avengers drawn together from different times includes both Hank as Yellowjacket in his most troubled times and an older, wiser Hank back in the Giant-Man identity.The juxtaposition of the two demonstrated how much Hank had evolved, and in some ways helped bring Hank full circle. A great story, and a fantastic Yellowjacket tale. Yellowjacket may not have been able to stand tall amongst his peers, but thankfully this statue stands proud amongst my Avengers statue display. 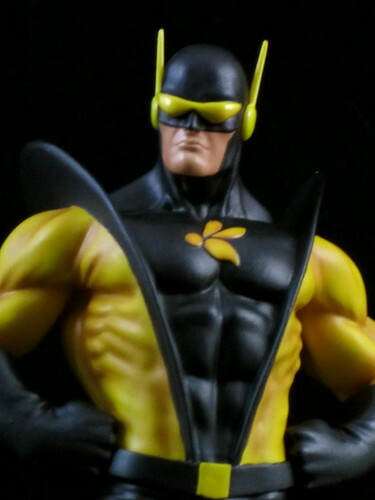 The sculpt is brilliant, not just in detail, but in the way that it manages to capture and communicate Yellowjacket’s “personality” and attitude through his stance and facial expression. The only thing I’m not 100% sold on here are his goggles, which are a little bigger and more joined together than his traditional comic book look. Definitely not a big detraction, but something that requires some getting used to. My customising friends tell me that yellow is a difficult colour to work with, but there’s no issue with the paint work here. There is some very nice shading work with the yellow, and nice texture and depth created through the use of some different sheens. The base is also a winner - a smaller, space saving base which is always a welcome fit. This is certainly one statue where no detailed base is needed - it speaks for itself! True Hank Pym fans will be pleased to know that Bowen has plans to address more of his costumed identities. The Giant-Man statue (a whopping 21”!) has been solicited, and the promo pics for this statue show other Giant-Man and Goliath versions (including the Clint Barton Goliath which I’d love to own!). These will all be complimented by at least two versions of Wasp that Bowen also has in the works. If you’re a statue collector and an Avenger fan, times are good at the moment! Now we need Randy and team to get on to the last few key Avengers characters that haven’t been addressed in either bust or statue form: Mantis, Swordsman, Moondragon, Starfox and my most wanted, Captain Marvel II / Photon / Pulsar, the lovely Monica Rambeau – I’ve probably left your favourite off the list, but for me these are the “must-haves” still missing from my Avengers display. While there are still some key characters to be covered, it’s a relatively small list in relation to the huge Avengers roster already covered. Always loved the Yellowjacket costume now if i could just find that dang Marvel Universe version! lol.